RIO GRANDE CITY — Hours after the top United States trade negotiator said it was unclear whether Canada, Mexico and the U.S. could reach a deal to modernize the North American Free Trade Agreement, U.S. Rep. Henry Cuellar predicted to an auditorium here that NAFTA will indeed get updated, not eliminated. In fact, Cuellar, D-Laredo, along with a wide Rio Grande Valley contingent will meet with high-ranking officials in Mexico City on Wednesday and Thursday to emphasize the importance of the two-decade old treaty that has transformed the Valley, as well as both countries. Sam Vale, a founding board member of the Border Trade Alliance, shared a stage with Cuellar at South Texas College’s campus here Monday and will join Cuellar in Mexico City later this week. The two complimented each other with perspectives from the national and local level. Vale is also president of the Starr-Camargo Bridge Company, the privately owned international bridge port of entry. The three countries don’t get the same benefits to being in the WTO as they do with NAFTA. Vale explained how, for example, if you go to the doctor, many of those supplies come because of NAFTA. Hundreds of thousands of jobs have been created due to NAFTA across the three countries, Cuellar said. Not only that, but there’s $1.3 billion of trade between the U.S. and Mexico every day, Cuellar added. The Trump Administration timeline for renegotiation is ambitious, which Commerce Secretary Wilbur Ross, who is heavily involved in the trade agenda, said last week will get tougher as more time slips away. The first two rounds of negotiations took place in Washington in August with Mexico beginning in September. Round three begins on Saturday in Canada. Despite a Trump push to get the deal done quickly, Canada and Mexico have rejected a recent U.S. consideration. Ross mentioned adding a “sunset clause” last week, which would mean a termination of the agreement every five years unless all three countries voted to continue it. “If every marriage had a five-year sunset clause, I think our divorce rate would be a heck of a lot higher than it is right now,” David McNaughton, Canada’s ambassador to the U.S., said. Cuellar scoffed at the sunset clause as well. 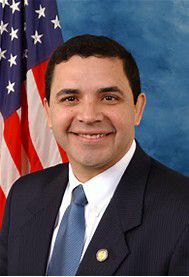 Cuellar has strong relationships with leadership in both houses of Congress, and was recently invited to a dinner at the White House regarding multiple issues. That dinner confirmed what Cuellar already knew: while Robert Lighthizer is the top U.S. trade negotiator and may be well suited to secure a successful negotiation, this deal falls at the request of Trump. And while Congress and stakeholders across the country have given their input, and will continue to, Trump could change his mind in an instant.